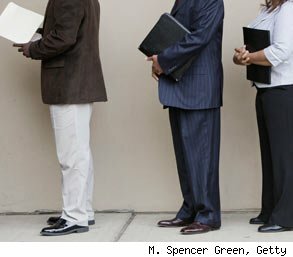 WASHINGTON -- Unemployment rates rose in more than half of U.S. states in June, evidence that slower hiring is affecting many parts of the country. The Labor Department said Friday that unemployment rates in 28 states and Washington, D.C., increased last month. Rates declined in eight states and were flat in 14. That's a change from May, when 24 states reported falling unemployment rates. Twenty-six states reported a net gain in jobs in June, while 24 states lost jobs. The changing trend in state unemployment rates reflects a weaker economy hampered by high gas prices and lower factory output. Nationally, employers added only 18,000 net jobs in June, the second straight month of feeble hiring. The U.S. unemployment rate ticked up to 9.2 percent. The economy expanded only 1.9 percent in the January-March period, and most economists expect similar growth in the April-June quarter. The government releases its first estimate for second-quarter growth on July 29. Nevada had the highest unemployment rate among the states in June, at 12.4 percent. That's up from 12.1 percent in May. California had the second-highest rate, at 11.8 percent. It was followed by Rhode Island (10.8 percent). North Dakota reported the lowest unemployment rate, at 3.2 percent, followed by Nebraska and Montana, both at 4.1 percent. Some companies are cutting their work forces. Layoffs rose to their highest level in nine months in May, according to a separate Labor Department report last week. Analysts are expecting another weak month of hiring in July, based on recent data. Economists at Deutsche Bank cut their forecast for net job gains in July to 50,000, from an earlier estimate of 100,000. Joshua Dennerlein, an economist at Bank of America Merrill Lynch, forecasts a gain of only 75,000 jobs. The economy needs to generate about 125,000 jobs per month to keep up with population growth and prevent the unemployment rate from rising. It needs at least twice that many to rapidly reduce unemployment.